Most health care professionals and therapists wholeheartedly endorse adopting nasal irrigation as part of your personal hygiene practice. At the very least, this practice should be included as an essential part of every sinus infection home remedy program. Nasal irrigation has been practiced in India for centuries as one of the disciplines of yoga. There are no harmful side effects, and what’s more important, using sinus irrigation systems can be of enormous benefit to the acute sinus sufferer. In addition, people prone to repetitive chronic sinusitis who practice sinus irrigation daily, invariably find that it improves their quality of life and reduces the use of medication, including harmful antibiotics and corticosteroids. The simplest technique for sinus irrigation is to snort lukewarm water from cupped hands into one nostril and let it drain out the other, however this is not the most efficient way of doing it. A more effective method is to use an appliance such as a neti pot. Make up a saline solution mixed with sodium bicarbonate as a buffering agent and ensure that the solution goes in one nostril and out the other. Better yet, if you can prevent the mixture from draining down your throat and can also overcome the gagging reflex, spitting it out the mouth is best. Employ a little pressure and pinch the other nostril closed. That way the solution will tend to infiltrate the sinus cavities as well. Not only will it clean out the sinuses, but it will also help to flush away residual muck left behind by postnasal drip. This is a rather challenging, more advanced variation of this technique, known in yoga as "Vyutkrama Kapalbhati". Learning how to spit the flushing solution out the mouth takes practice, persistence and dedication. However, if you can master the technique, it will make all the difference to your sinus infection home remedy program. half a cup of filtered or previously boiled water. 5 milliliters (1 teaspoon) of sea salt or non-iodized salt such as canning or pickling salt. Optionally, another 5 milliliters of baking soda as a buffering agent to prevent the salt burning. 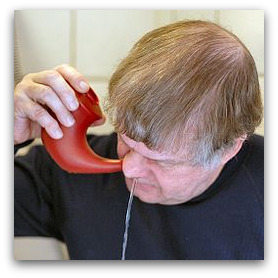 There are a number of readily available nasal flushing appliances, such as the Tiki Pot, the Neti Pot (Neti is Sanskrit for "nasal cleansing," by the way), together with a number of more advanced nasal irrigation systems available online. If you can’t lay your hands on one of the above immediately, snip a corner off a Ziploc bag, and use that. If gravity isn’t enough to push the mixture through, you can squeeze the bag gently to help things along.